J.O. Bass (James Oscar) was born in Atlanta, Georgia in 1879, one of seven children. His family moved to Texas when he was 11 and settled in Quitaque in the Texas panhandle. It’s unknown exactly who taught Bass the craft of blacksmithing and bit and spur making but he learned well and his pieces always exemplified the highest quality. Bass began working in general blacksmith work in Quitaque for ranchers and cowboys. In 1905 Bass and his new wife moved to nearby Tulia, Texas where he would live and work until the tail end of his life. Bass was one of the few masters who worked continuously instead of employing others in his name and did a lot of custom order work and as such most of his work is high quality and quite rare. Since Bass did all his own work, there is not the quantity of it available that you would find with makers who employed others to do work for them. Bass is famous for having kept a ledger of his work that shows sketches of each piece as well as numbering each pattern he produced. His ledger also kept record of who had ordered each piece as well as what they were charged. Just as J.O. 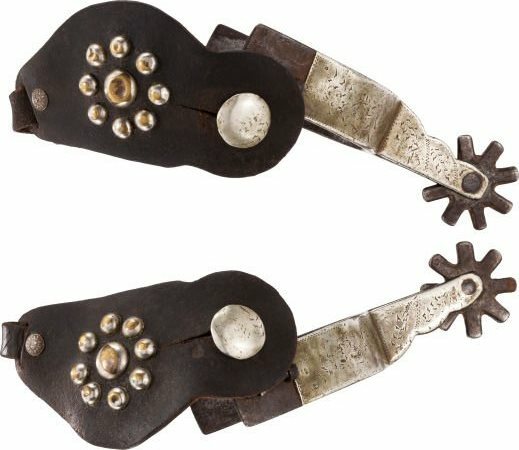 Bass was particular about keeping good records, he also was helpful to collectors for the detailed markings he stamped on the bits and spurs themselves. His work would be stamped “J.O. Bass Tulia, Tex.” (or Quitaque for his earliest pieces), as well as the pattern number, and sometimes the date. Bass also invented a locking rowel that is unique to his work. He was fond of using card suits as decoration, but because most of his work was custom ordered, there is a huge variety and breadth to the patterns and designs that can be found. Markings: “MADE BY J.O. BASS TULIA, TEX” or “J.O. BASS QUITAQUE, TEX.” along with pattern number. Letters are stamped individually along the cheek of bits and on the off side of the spur heelband. For help identifying and appraising any J.O. Bass bits or spurs, please Contact Us. Click here for information on Bass Maker’s Marks.